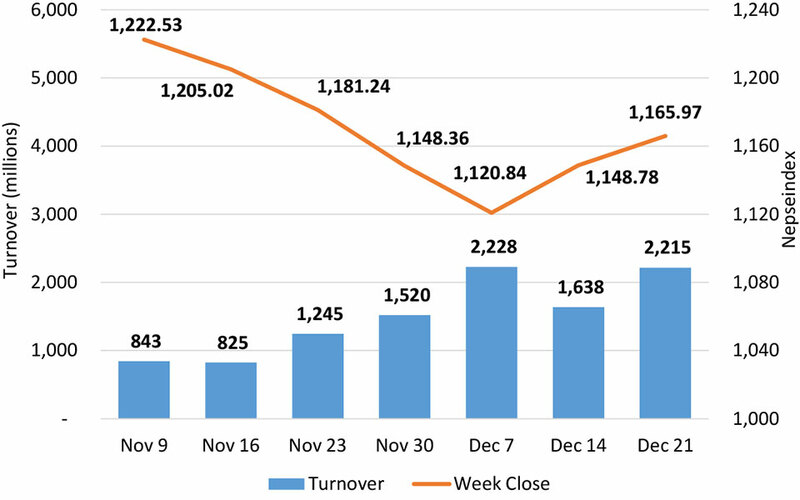 KATHMANDU, Dec 22: The week's trading took off on a positive note as the Nepal Stock Exchange (Nepse) index jumped almost 19 points on Sunday. The bourse also witnessed considerable strength on Monday with the benchmark index further adding more than 15 points. However, following the news of interest rate hikes by major commercial banks mid-week, Tuesday saw the index wipe all the losses that came on the session earlier. In the remaining two sessions, the index posted modest moves to either side but managed to close the week higher by 17.19 points or 1.50 percent. Eventually, Nepse settled at 1,165.97 points. The local bourse, which bounced back from its 3-year lowest level in the past week, further stretched its recovery. 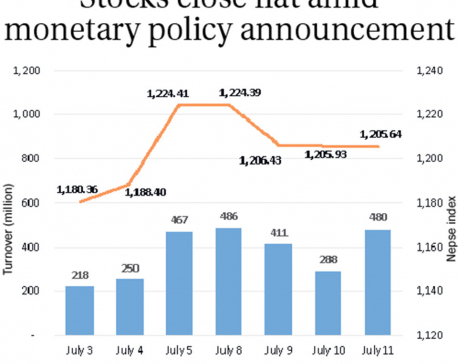 Following another agreement among commercial banks this week to curb the interest rate hike, the equity market can be expected to get another brief impetus next week to climb to higher levels giving investors the opportunity to eke out some gains in the market. Trading activity also improved in the review period. 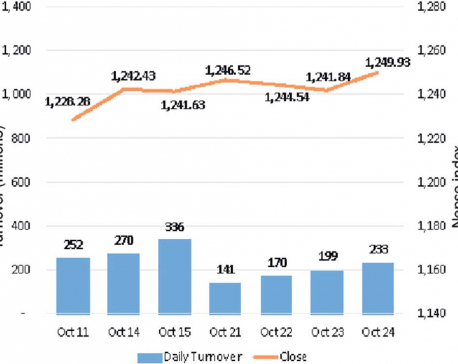 The equity market experienced a total turnover of over Rs 2,215 million compared to Rs 1,637 million in the week earlier. Sensitive index, gauging the performance of Class 'A' stocks, slightly underperformed. Nonetheless, the index closed with a gain of over 1 percent. Following the broader index, most of the traded sectors also ended in the green. Insurance stocks, which have seen a tremendous downfall in the past two years, made significant recoveries this week. Sub-index of Life Insurance stocks rallied 5.10 percent, while that of Non-Life Insurance sub-group surged 4.71 percent. Major gains also came from Microfinance stocks as reflected by a 4.26 percent rise in the segment's sub-index. Meanwhile, Development Banks and Banking sub-indices added 1.79 percent and 0.60 percent, respectively. Conversely, weakness was visible among Trading sector as its sub-index shed 1.40 percent. Hotels and Hydropower sub-indices also posted modest weekly losses. Among major dividend announcements this week, Nepal Telecom Company Ltd announced 55 percent cash dividend to its shareholders from the earnings of fiscal year 18/19. Besides, Himalayan Bank and SBI Bank Ltd also declared their respective dividends. Both the banks will be distributing 5 percent bonus shares and over 10 percent cash dividends to the corresponding shareholders. Meanwhile, Prime Commercial Bank Ltd is opting to distribute 16 percent stock dividend. ARKS technical analysis indicates the market forming two bullish candlesticks in a row in the weekly timeframe. Reflecting the gains, Relative Strength Index (RSI) bounced back from oversold territory suggesting a likely shift from the bearish sentiment in the short term. However, for a more sustainable recovery, it is essential that the index breaches the weekly resistance of 1,270 points mark.